Three Pipe Problem: Google Art Project : how to confuse a critic? Google Art Project : how to confuse a critic? The world has been abuzz with talk of the Google Art Project. There has been some interesting discussion about its impact on the world of art history, with the overwhelming sentiment being a positive one. This is primarily because Google and their partner museums have created something which did not exist before, and enabled access for free to anyone with an internet connection and a supported browser. It has been interesting to note the reaction to the project and its global impact. It appeared on mainstream media and online, even becoming a worldwide trending topic on Twitter. There has been some grumbling however. One of the more surprising of these naysayers has been none other than Waldemar Januszczak, UK art critic and documentarian, mentioned frequently here at 3PP. Waldemar Januszczak encourages people to look at paintings very closely, and compare them to similar works around the world... this is also another way to describe the Google Art Project! I have often promoted Januszczak's work here at 3PP. This is not because I agree with everything he says but I enjoy how his programs are presented with a general audience in mind, and inspire people to look for answers beyond what the museums and catalogues tell you. The way he confidently disregards traditional art history readings is something which admittedly spurred me on to create this site. It is this questioning bravado that I would like to now turn back upon Januszczak. Below is a short clip from my most favourite of his series, Every Painting Tells a Story. This sub 2 minute clip is snipped from the lovely episode featuring Jan van Eyck's The Arnolfini Portrait, in which Januszczak is essentially acting as advocate for the memorial portrait reading famously proposed by Margaret Koster of the Courtuald. What is most poignant about this clip is how he uses examples from 3 separate galleries and includes deep close ups of the works in questions to prove his point. Is this not exactly what something like Google Art Project, or any online resource would be absolutely delightful for? For someone working in such a visual medium as film, making works aimed to promote interest to a wider audience, I would imagine these parallels would be quite obvious! Januszczak uses gallery globetrotting and deep zoom in his own program, but seems to think Google promoting everybody being able to do this from their computer is a bad idea? These are some of his comments on Twitter, in response to an article posted at the Telegraph. It must be noted Januszczak is not an art scholar in an academic sense. You won't hear him chirping on about his theories on Giorgione's Tempest at academic symposia. Januszczak has always dwelt in the public eye, as a journalist, film maker and occasional author. He also served at Channel 4 and co-curated a 2008 show on sculpture at the British Museum. His laid back style, which attracts the ire of old school art critics like Brian Sewell is refreshing and engaging. My greatest praise for him is that his work in popular media has brought art to the people - and it is the people who watch his shows and read his columns that are the basis of his success. I wonder if he has forgotten that? Of course, seeing a work in person will never be the same - but this does not always mean it will be better! Last year I stood in a crowded Uffizi and gaped at Botticelli's Venus surrounded by dozens of other people. It is stuck behind a greenish tinged glass and the room is poorly ventilated. Tour guides talk over one another and spin the usual trite descriptions of these works. As I previously reported, I did enjoy being able to see Raphael's self portrait in person, but its setting was far from grand and ideal, and gave me ZERO extra appreciation for the young master from Urbino. My beloved Raphael in a scuffed, dingy corner in the Uffizi. Size, scope, grandeur in situ? Is this really the ideal that the "you must see it in person" crowd are trying to promote? I'm more in favour of the example of the project used by a student, in any part of the globe, looking at a painting in its exquisite detail. The student may be working on a school project or browsing independently. I commonly receive feedback from students. Formative experiences in art are primarily through media and movies, not always a museum visit. The internet has also become a strong primary resource for people of all backgrounds to improve their knowledge. Such an experience will pique interest and lead to a search for more information - most commonly via search engines such as Google and Microsoft's Bing. The whole point of Google Art Project, and art history blogs is to promote interest in art and provoke discussion and collaboration. Considering the kicking the humanities have been getting in both academia and the public eye, it is supremely clear the advent of digital media is doing a better job at promoting art and history than the average jaded critic or art historian. Google Art Project will never be substitute for the real thing - but it is also a valuable new tool for art fans and educators to utilise. Unlike Januszczak, some of us do not have the luxury of having a room cleared for a documentary filming, or live in a country where access to some of its greatest museums is free. Apparently, Januszczak is planning an article expressing his deep dismay at the Google endeavour. I sincerely hope he brings more to it than "it isn't the same as the real thing." This is not the stated aim of the project. Just like his wonderful programs - they are a resource that can be used to enhance learning and engage public interest. Simple as that. Edit: Januszczak did eventually get around to writing about the Google Art Project in a piece dated February 15th 2011. Persons interested in reading it can do so via this link. To summarise, it seems Januszczak is caught between the emotional experience of seeing art in context, and the usefulness of having access to high quality images, which he admits are valid in the context of research and educational endeavours, including his film presentations. Real art experiences are not interchangeable with internet passions, any more than real Czech girls are identical to the ones pictured on dating sites. I’m not saying the Google Art Project needs to have warning signs plastered across it saying “Viewer beware”. But isn’t rule number one of digital behaviour “Nothing is what it seems”? What Google and their partner agencies make of this initiative is of course entirely up to them. Anyone interested in having free access to high quality images will find the project useful. Anything beyond this however, enters the realm of the subjective and rhetorical. Of course Google can never replace an art experience, though I think it has been clearly stated this was never their aim - despite what its critics say. Congratulations. You're right on. Does Janusczak advocate stripping the National Gallery of its collection of Renaissance art and restoring the paintings to the churches they were taken from? Projects like google art will only increase attendance at Museums. Cheers for the comment Frank. I absolutely agree that this project will only serve to make people more interested in seeing works in person - especially in the UK. For those of us that are quite distant from the great art centres of the world, it's just another great resource we can use to improve our knowledge. As far as stripping the NGL of stolen works, you may perhaps have an ally in Januszczak there. 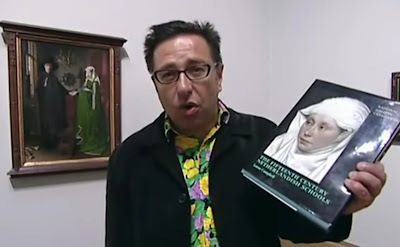 In that Arnolfini program he clearly states how the van Eyck masterpiece was stolen by a Scottish Soldier from the Spanish Royal family after the Peninsular War. Not too long ago, he also tweeted himself into a hornets nest when he called for galleries to offload some Old master paintings to pay for new innovations. Whilst a a noble idea - is hardly based in the financial realities of what draws people to these musuems. There seems to be a hangup about technology with some art historians, wether in or outside the Academy. I wondered why Janusczak is brandishing a NG catalogue. I'd be the first to admit they're unbeatable, but I go to those for information, not for close analysis of the pictures, which Google Art Project offers. I looked at the Ambassadors on it yesterday, and the detail was incredible. I even risked a look at Caravaggio's Medusa- but had to pull out as it's horrifying in high resolution! I admit that virtual images are no substitute for the real thing, but unless you're a curator dealing with pictures every day, you're hardly likely to have that privilege. Sure, I can get permission to look at drawings and paintings in situ, but that costs money and travel is getting more expensive all the time. So well done Google, and VJ stop your whining. Not much to add to what's been said above. Just agree that I think the G.A.P. will benefit museums (so long as it doesn't facilitate art theft!). In some ways, looking at the high res scans is better than looking at the originals. Try scrutinizing the Ambassadors like that without getting "too close" or otherwise breaking the museum's rules. But in other ways, the scans remind one of what you can only appreciate in the originals--scale and (especially) texture. Besides, I go to museums for the "museum-ness" of the experience, not just for the art, and google will never be able to replicate that. I think Google Art Project is utterly fantastic. 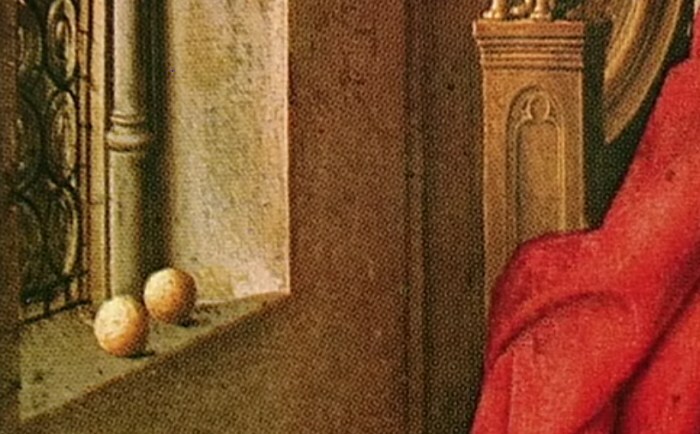 Many of the reproductions in art history don't give a sense of detail (which is something "crucial" to understanding many works of art - like Jan van Eyck, for example). The general populus do not have access to subscription image databases like ARTSTOR, and I am thrilled to see that Google Art Project is giving people the opportunity to look at art in depth. Cheers for the comments David, Ben and M! It is heartening to know that as representatives of art historians working as educators that you can see the project for what it is - a new resource for you to use with students, as well as something that may attract the more students to develop an interest in art. I think an under-mentioned fact is the massive scope of the project. As far as sheer volume of traffic worldwide, Google can reach so many more people than a teacher, blogger, journalist or documentarian. From a logistical perspective - I can even see the project being useful to documentarians in the future. If a high res scan exists online, why send a camera crew to take a deep zoom shot? You can already see something analogous with many TV news and weather services using Google Maps to supply their satellite mapping images. The feedback I have received from 3PP's numerous student readers has been amazing. All genuinely excited, having fun looking at art and learning about the Museums they are in....for free. I personally can not understand how that can ever be a bad thing! Just thought of something else. Most great museums have more in storage than they exhibit. 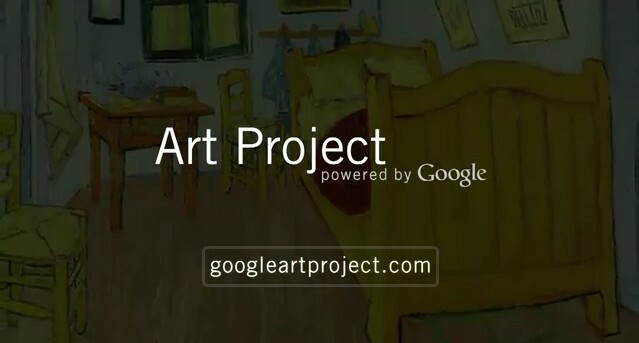 Wouldn't it be great, especially for students, if google Art will include those works? Introduced two classes to this project so far. Audible gasps from the students. Some of the nicest things about this project are really pretty simple. I love the fact that you can create a themed collection (including details) and then share it with others. So I can create a customized collection for each of the classes I teach and then share that collection with the relevant students. I believe that there is some misunderstanding about paintings in respects to images. Paintings may also be images but they are also three-dimensional objects that function primarily as objects. Their third dimension, only the fraction of an inch, is absolutely critical to the artistic experience. Paint can be thick, thin, transparent, muddy or an almost infinitely varied. Even though I am a painter (40 years every day at the easel) who knows fairly well how to “read” a reproduction, I am always amazed how the real work possess a greater expressive dimension than cannot be drawn from even in the best images. Google images and the general proliferation of art reproductions not only familiarize people with works or art, they likewise run the risk of subverting the essence of painting by transforming it into a mere image with no dimension or body, its sine qua non. While scrolling text does not diminish the sense of what is written, scrolling a painting on the monitor goes against how we naturally experience a painting. I hope those more intimate with the workings of paintings will keep their guard high and not let the concept of image and painting slowly becomes blurred. Thanks for the stimulating discussions. @Frank - that is a fabulous idea! @Ben - great to hear that the students had a positive experience playing with a new resource which I dare say will benefit them more than anyone else. @Jonathan - welcome to 3PP! The physical factors you mention are most important when considering technique, and assigning attribution. This is far removed from the aims of the project - which is simply to make images and information more accessible to people around the world. As someone who has created one of the premier online resources about Vermeer, I would think you would be a greater advocate for the benefits of a centrally accessible (free) resource! To those who are more interested in the meaning of the images and symbols, as opposed to the means used to achieve them, the 3rd dimension in a Titian, Giorgione or van Eyck is almost irrelevant. I'd prefer a nice zoomable pic I can put in a post to clearly illustrate the point at hand. H-Speaking as an amature, I don't think this will cause people to "forget the importance of "the real thing" for the simple reason that we have been saturated with reproductions of art for a very, very long time already. Have you read "The Work of Art in The Age of Mechanical Reproduction"? I believe that the more people who are introduced to great art, the better. I don't doubt this will dismay some people from occasionally heading to museums to look at artworks (perhaps some will completely quit the venture). But the question is how many of these people are true art lovers? Are they really the ones we should worry over? I think those who love art will eventually tramp around the museums, Google or not. Cheers for the comments and welcome to 3PP! @Douglas - I believe you are referring to Waler Benjamin's famous essay from 1935. Definitely some analogous aspects to this dicussion. For those interested, it can be found online pretty easily. @EEH - That's right! Some of the greatest Museum spaces have their own ambience that presently can not be recreated. That is something that is beyond the project, yet seems to be what critics like Mr Januszczak and others focus on. Accessibility as well as the creation of a resource are the fundamentals of what Google and the Museums are trying to do. As usual, a deep reflection that goes beyond most of the sites that are reporting on this news (mine included i'm sad to say). I totally agree that the issue is not "is it better in person" but that this is a tool for research or just to expand our horizons. Your point about the lame display of that little Raphael at the Uffizi is so right - with displays like this, sometimes a book would be better!! I do think, though, that the street walk technology is not at the level that its footage can be reused for documentaries - it's too jerky! Cheers Alexandra! Your observation of street view used to map the museums is spot on. Google and the partner museums have deliberately scaled back image quality on this aspect - compared to street view for Google Maps. This was done for two reasons, firstly because they never were attempting to recreate the museum experience, and secondly the lower fidelity street view images would make it more accesible to people with lower end computers and on slower connections.